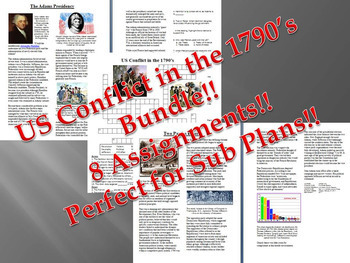 A bundle of 7 reading assignments about the political conflicts in the US in the 1790's including the two party system, the French Revolution, John Adams, and the Alien and Sedition Acts, and much more. See the preview slide for a complete listing. Includes a crossword puzzle based on terms from the readings. A great way to introduce the subject. 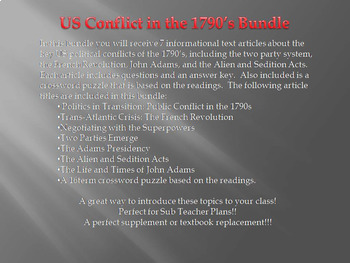 The reading comes from a really great website, ushistory.org, under their free textbook tab. The information presented is theirs, I made up the questions. This can be done as a web quest assignment using the site. Perfect as a supplement, or as a textbook replacement! Also great as a Sub Assignment. MS Word for easy editing.